No tactic strengthens the relationship between a brand and its social media audience more than interacting with them in a consistent manner offline. To bridge the gap between fans on social media and sporting events, many baseball teams have been hosting Social Media Nights since as early as 2012. These events vary from team to team, but are usually held once a year or as a part of a game day experience for select fans. The goal of Social Media Night? To incentivize attendees and encourage them to share their experiences while at a game on social media. These activations increase brand loyalty and improve a team’s visibility. Start scoring big with your most active fans and host your own Social Media Night by following these best practices that can help you stand out among competitors and and engage your following with purpose. The key to a successful Social Media Night is to make it simple and organized for attendees to share their experiences. Focus on pre-planning to ensure there is no confusion amongst fans about how to participate. Ahead of one of the Houston Astros’ Social Media Night the team shared the following information on its blog to provide fans with a clear understanding of what to expect from the evening and how to participate effectively. Clearly communicating your event details helps manage fan expectations, promotes your Social Media Night and eliminates confusion and will ultimately help increase social engagement on game day. Drive fans to discuss your team before, during and after Social Media Night by offering giveaways for all guests as well as the chance to win additional incentives like a signed photo from a player, a team meet and greet or tickets to a future game. The Milwaukee Brewers awarded all attendees of their Social Media Night with a custom Brewer’s team selfie t-shirt, tickets to an upcoming Brewers vs. Marlins game, access to a Q&A held on Twitter with outfielder Carlos Gomez. Fans also had the opportunity to win other prizes throughout the duration of the evening. Offering exclusive incentives in the form of prizes and access to events and talent gives fans more motivation to share their excitement on social. It also allows the team to personalize the experience for their broader social audience and, since fans are being rewarded for their efforts, helps build team loyalty. Engage attendees at the game by setting up specific areas where fans can produce and share custom social content. At the Pittsburgh Pirates’ Social Media Night the team created a lounge where fans could use the popular lip-syncing video app, Dubsmash, to recreate some of the best calls of the year and share them on Twitter. In addition to the lounge, the team built a photo booth area where fans could take photos with large cut-outs featuring franchise-specific emojis of the players and mascot. The Mets awarded some attendees of their ‘Social Media Night’ with a welcome greeting of their Twitter handle on the scoreboard, showcasing these loyal fans to the entire audience at the stadium. Encouraging featuring them across your social accounts to showcase their participation offline and your team’s appreciation of their support. Fans were not only able to engage with the team at the stadium with an interactive lip-synching activity, but would potentially be featured in videos shared on the Pirate’s Twitter account. Stand out against the 27 million pieces of digital content shared daily and ensure everyone at your Social Media Night feels like an all star by engaging the crowd with custom social content. Develop and purchase a Snapchat on-demand geofilter that participants can use in their Snaps. These filters are triggered by a geofence around the location of the ballpark, so they can only be used by those at the game. 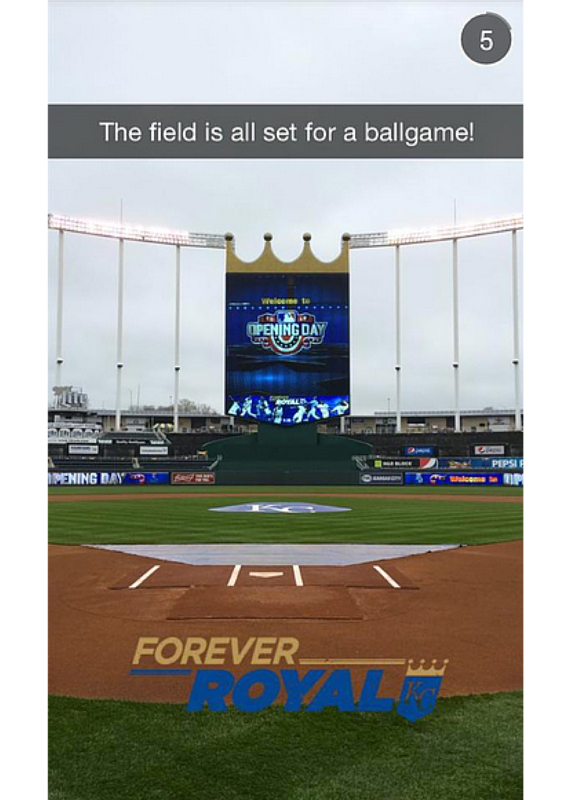 The Tampa Bay Rays, Philadelphia Phillies and Kansas City Royals have created Snapchat filters that make it easier for fans to share their location and customize their Snapchat photos and videos. Live streaming behind-the-scenes footage on Facebook Live or Periscope is another way to create custom event content. It also presents an opportunity to interview fans and share with viewers on social media what these nights are like. This real-time, custom content will help captivate existing fans and encourage them to attend future Social Media Nights. Build a stronger connection with your fanbase by regularly hosting a Social Media Night dedicated to social media engagement with fans and rewarding them for their participation. Create a successful night by planning your approach effectively, incentivizing participation, engaging fans in person and creating custom content to drive more brand awareness. After the game, measure and analyze your event’s hashtag performance, social impressions, inbound and outbound messages to determine the impact of your efforts. Use this data to better understand the needs of your audience and allow it to influence your team’s future content and social strategies.